Proper nutrition is one of the easiest ways to keep our bodies fueled for the challenges of day-to-day life, but too often, our diets let us down. According to the Centers for Disease Control and Prevention, 76% of Americans don’t eat enough fruit, and 87% don’t eat enough vegetables. We get too little dairy and too much salt, saturated fat, and sugar. We pay the price for those decisions in ways that are both obvious—expanding waistlines and chronic conditions, including heart disease and diabetes—and subtle. Poor nutrition can sap our energy, spoil our mood, and make us less productive at home and at work. Lost productivity related to illness costs American businesses $260 billion each year, and much of that can be attributed to how we choose to fuel our bodies. The good news is that getting nutrition right is easy, and employers can play a role in helping their employees eat better. Carbohydrates are the primary source of energy for our body, brain, central nervous system, and muscles. Simple carbohydrates like fruits and dairy create a spike in blood sugar that can be slowed by pairing with protein or fat if needed, while complex carbohydrates like pasta, rice, and vegetables provide longer-lasting energy. Carbohydrates should make up 45% to 65% of total calories, primarily from complex carbs. Proteins from meat, eggs, or other sources help build bone and muscle and repair tissue, in addition to acting as a secondary source of fuel if we don’t get enough carbohydrates. Proteins should make up 10% to 35% of calories. Fats act as an energy reserve and protect our organs, carry fat-soluble vitamins, and help regulate our hormones. They also help us feel full and satisfied. Healthy fats from foods like avocado, nuts, and olive oil are preferable to saturated fats like those found in butter, cheese, and meat. Fats should make up 20% to 35% of total calories. Even those guidelines are more complicated than most people truly need, though. For better nutrition, just remember to eat more whole foods and do more of your shopping on the outer edges of the grocery store and less in the aisles of processed foods. That doesn’t mean you never get to eat cake or cookies, though. The 80-20 rule is a good guide—that is, 80% of your diet is healthy foods, and 20% is open to your preference. Too many people today have this formula flipped. Additional guidance is available from tools such as on-demand, virtual fitness, which, in some cases, offers classes on controlling consumption of comfort food, making healthier food choices, or enjoying your food. The information in those classes is useful as we try to eat healthy while managing busy lives. When we’re balancing work, activities, and family, it’s easy to push nutritious food to the wayside for a quick, easy option. The healthy option doesn’t have to be difficult, though. You can prep a week’s worth of lunches in half an hour if you plan ahead. Other simple changes can make a difference, too, such as substituting more vegetables in place of iceberg lettuce if you’re making a salad. Generally speaking, the more colorful vegetables you add to a meal, the healthier it will be. Given the connection between nutrition and productivity, employers have an important role to play. Want employees to stay healthier and more productive? Here are a few easy suggestions for helping people make healthy choices. 1. Make the healthy choice the easy choice. Try offering healthy snacks in meetings instead of cookies or donuts, or skip the snacks altogether. If you have vending machines, make sure they’re stocked with something other than candy bars and sugary drinks. 2. Help employees eat in. Lunchtime fast food runs are the bane of any healthy diet. If there’s a refrigerator and a microwave in the office, it will be easier for employees to bring lunches from home. 3. Bring back the water cooler. When people get dehydrated, they sometimes mistake that thirst for hunger, so giving people easy access to drinking water might curb their appetite. As a bonus, adequate hydration also helps people feel more alert. People get busy at work, but we’re more likely to make bad choices if we’re always trying to squeeze in lunch at our desks. Focusing on work while we eat means we’re not paying attention to what we’re putting in our mouth, and we continue eating even though we’re no longer hungry. Slowing down to eat and eliminating distractions can help us make better decisions. Sometimes just creating the right environment to make healthy food choices isn’t enough. 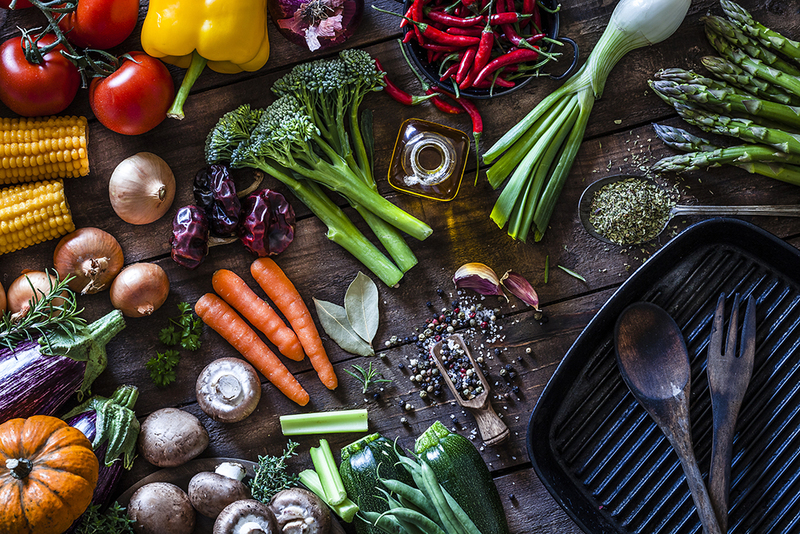 Employers might need to offer a little guidance and encouragement, such as cooking or meal-prep classes or on-demand fitness classes focused on nutrition, which can help employees develop the skills they need to be more mindful about their food choices. The bad news is that we often don’t think when making our nutritional choices. We grab what’s available and go, which has consequences down the line, even though it feels good in the moment. But the good news is that the solution doesn’t have to be difficult, and it doesn’t have to mean giving up the foods we love. With a little preparation, a little mindfulness, and perhaps a little coaching, we can all make better choices about what we eat. Kim Waters, PhD, has a B.S. in nutrition and fitness and a PhD in health promotion. She is Content Manager and Video Talent for Wellbeats, a content and software-as-a-service company that delivers on-demand, virtual fitness programming for corporate wellness programs. To view the full article published in HR Daily Advisor, click here.